When Paula’s invitation popped into my inbox several years ago, I did a double-take. A friend from my small, tight-knit, online writers’ critique group, Paula grew up in Alaska and longed to share her beautiful and beloved home with us. I don’t remember exactly what I said, but it went something like this: Um, yes, please! When? We worked out the details and that June, I boarded a plane for the cross-country trip to Anchorage. Two other friends, Nancy from Chicago and Wendy from California, came too, and we all converged on Paula’s and her family’s home for a week. Alaska was so different from my everyday experience. Each day was filled with surprises; each evening was filled with daylight long after my bedtime. We went sight-seeing, shopped in local markets, ate at Paula’s favorite restaurants, and consumed copious amounts of chocolate (or at least I did). We talked a lot about writing and about our lives and just enjoyed being together. One day, we piled into Paula’s car and went south on scenic Seward Highway. Our goal? To see a glacier! I’d never seen a glacier before and couldn’t wait to get there. As we drove south alongside the water, bald eagles—yes, bald eagles!—flew beside us and dove into the water for their next meal. Paula pointed out mud flats, where mud had been deposited by the tides. They could be dangerous to humans but apparently not to bears, because in the distance, we saw two young black bears, maybe siblings, splashing around like they were playing and hunting for fish. I was amazed. On the drive, Paula explained that the glacier is located on the Kenai Peninsula in Kenai Fjords National Park, one of the least accessible and most remote national parks in the US. There’s only one way to access the park by road, and that was where we were going. A couple of scenic hours later, we turned off the highway onto Exit Glacier Road, and I was amazed again—at the sight of a glacier on the side of the road. 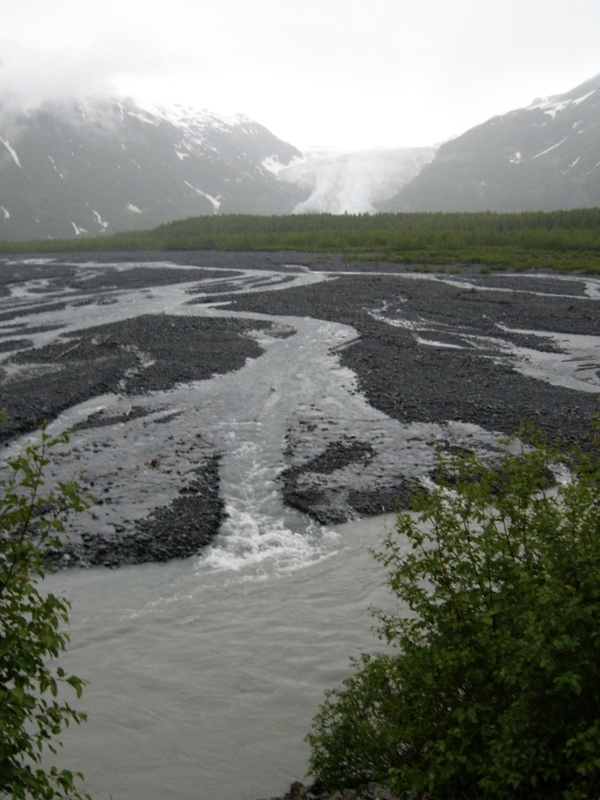 Exit Glacier, which derives from Harding Icefield, is a valley glacier, a stream of ice that is confined to and flows downward in a steep walled valley. It got its name because it served as the exit site for the first recorded crossing of Harding Icefield in 1968. Its accessibility continues to draw adventurous hikers and mountaineers today. We, however, were not adventurous. Hikers who want to see Exit Glacier up close can follow any of several short trails leading from the Nature Center. They must cross the wash plain to do so, however, which can be challenging depending on the water levels from the glacier. But we did not cross the plain—just the parking lot. After getting more information about the area at the Nature Center, we opted to stay dry and firmly grounded and just enjoy the view from the overlook. The sky was gray and overcast. Cold, damp air turned my nose red and seeped through both my jacket and sweatshirt. Even though the summertime high in Anchorage that afternoon was in the 60s, the temperature at Exit Glacier must have been in the 40s. I felt every bit of the chill, but that was only fitting: after all, I was less than half a mile from a real glacier. Amazing. On the way back to the car, I noticed Paula’s license plate. Written on a yellow-gold background were these words: “Alaska, The Last Frontier.” It certainly felt that way to me that week, as my friends and I drank in the beauty of that wild, wonderful land. Have you ever been to a place that amazed you? Where? And why? I’d love to know! Leave me a comment below. Thanks for stopping by my blog, Glimsen, where I share glimpses of the beauty around us in nature, the arts, and the unexpected. If you like what you see, sign up to receive my blog posts and updates by email, and you'll receive a free gift of beauty in your inbox. You can also find me on Facebook and Instagram. I look forward to connecting with you.